This fantastic new Louis van Gaal book in FULL COLOUR gives you the unique opportunity to learn from the man himself about his coaching philosophy. The included 35 Louis van Gaal practices are from his time with the Netherlands, AZ Alkmaar, Bayern Munich and Manchester United. 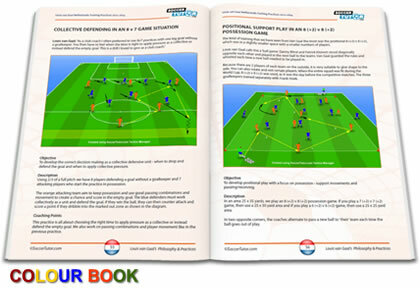 The Netherlands training practices in this book were observed at Quick Boys in Katwijk, at the Dutch training accommodation in Hoenderloo, in various stadiums across Europe, during the 2014 training camp in Lagos (Portugal) and in Brazil during the World Cup. There were many of the same types of training, but the methodological progress was thought out and the coaching moments were increasingly detailed and demanding.